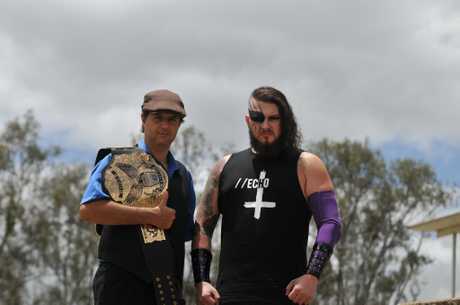 FOR Rainbow Beach man Casey Eichmann, this Saturday's Wide Bay Pro Wrestling event at Cats Oval is a culmination of more than two years of hard work, dedication and motivation. Despite what you may think, the art of entertainment wrestling is not something you can pick up by watching TV. Eichmann is making the transition from life-long fan and referee to main contender at Saturday's When Worlds Collide event at Six Mile. "I have been a fan my entire life," Eichmann said ahead of his debut. "I saw a show on the Sunshine Coast and signed up. "I started training and have spent the last couple of years or so being a referee and have been building up to this moment for a while." Wide Bay Pro Wrestling promoter, Anthony "The Bull" Romano (aka Anthony Puleo) said the storyline of this weekend's event is unique and will feature the organisation's first five wrestler match-up. "My premises was invaded and my brief case, which has all the Wide Bay Pro Wrestling ownership paperwork and Brute Force title, was stolen," he said. "Within that brief case is also a contract that allows anybody to cash in on any title, which is the world heavy weight title and Brute Force Title." The scenario will be played out at When Worlds Collide on Saturday night and Echo Eichmann is ready to take the belt. "This being my first show, I am just hoping it all goes well," he said. Gates open at 6pm with the wrestlers entering the ring at 7pm. Entry is $15 for adults, $10 for children with kids under seven free. Wrestling fans are encouraged to take part in the pre show entertainment where they can have a photo with the championship belt.